Climate Change and Global Warming – wildfires and decreasing water tables – So, they’ve been seeding the clouds for Las Vegas and snow skiing and water for where? LAS VEGAS, Sept. 1 (UPI) — A state water authority manager suggests providing public funds for seeding clouds in Northern Nevada for drinking water in Las Vegas. Southern Nevada Water Authority General Manager Pat Mulroy suggested his agency provide funds to keep a Desert Research Institute cloud seeding program operating, The Las Vegas Sun reported Monday. Water authority staff members must determine whether it would be in southern Nevada’s best interest to fund part of the cloud-seeding program, so the DRI could continue seeding above the Colorado River basin and other basins. DRI has 23 cloud-seeding stations in Nevada and six in the Sierra Nevada range along the California border, which create an additional 65,000 acre-feet of precipitation, mostly snow. This increases the snowpack by between 2 percent in wet years and 10 percent in drought years. When that melts some of the water recharges the aquifers in the lower valleys and provides water to Las Vegas, Las Vegas Valley Water District spokesman J.C. Davis said. 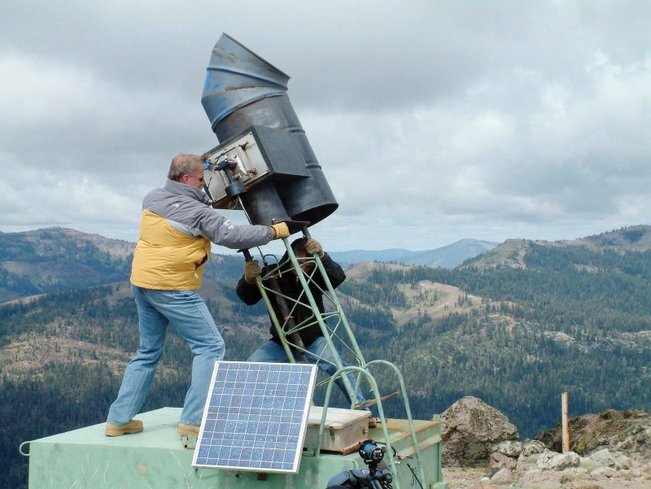 As a form of weather modification, cloud seeding is aimed at stimulating snowfall in selected mountainous regions of Nevada to increase the snowpack, resulting in more spring runoff and water supplies in the surrounding areas. The Nevada State Cloud Seeding Program is operated by the Desert Research Institute Division of Atmospheric Sciences, located in the Northern Nevada Science Center (NNSC), Reno, Nevada. The State program originated as an outgrowth of DRI weather modification research programs funded through USBR and NOAA. Current DRI research is focused on the quantitative evaluation of winter storm cloud seeding using trace chemistry, atmospheric model simulations of seeding plume transport, and hydrologic modeling to estimate the additional runoff due to cloud seeding. To what extent has this ongoing cloud seeding program contributed to the increasing desertification of the Western and mid-Western United States? And, why didn’t they seed the massive hurricanes in the Gulf of Mexico before they wiped out populations along the coast? When did these programs get auto-magically created despite the possible repercussions – what happened to the whole argument about cloud seeding not being viable because of the potential that it would alter the weather patterns, cause drought conditions in other areas, create flooding where it wasn’t intended, etc., etc., etc.? And who the hell decided to go ahead and to seed the clouds on a massive and regular basis without it becoming common knowledge in the news, in academic communities and around the rest of America? And – when Hurricane Katrina was bearing down on the coast as a category 4 or 5 storm – why didn’t the experts from NOAA and Universities who appeared on cable news and discussed seeding those storm clouds say anything about the cloud seeding program that had obviously been in use over the last fifty years, certainly since the 1970’s as a common practice? I just don’t get it . . . unless human lives mean nothing to the Republicans – is that the one defining factor that I’ve failed to recognize about them which makes the rest of it make sense? You know what it amounts to, is that the people in California are just going to have to move. Its ridiculous to have that many people and that much of our infrastructure sitting on an earthquake zone with mud slides, Santa Ana winds, wildfires, smog, pollution and rising sea water levels, yet without enough usable water for the population to actually survive. It isn’t going to work anymore – we might as well start making room for them somewhere else around the United States because they sure can’t keep living there.